Cover features CCM presidential candidate, John Magufuli (left), and CHADEMA / UKAWA candidate, Edward Lowassa (right). 1. 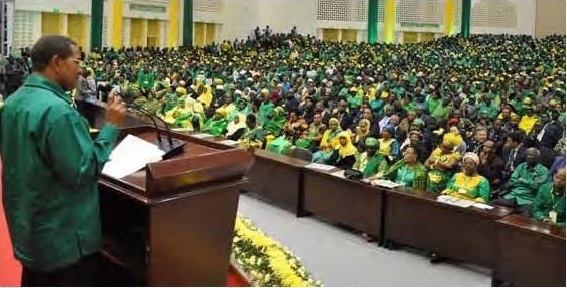 In July as all the political parties were having difficulty in choosing their candidates for the presidency, the ruling Chama cha Mapinduzi (CCM) party decided to steal a march on the others by bringing forward their own selection process and forcing the other parties to do the same. 2. It seemed as though almost everyone who is anyone wanted to become president. A total of no less than 42 CCM leaders, an unprecedented number, registered their desire to stand. 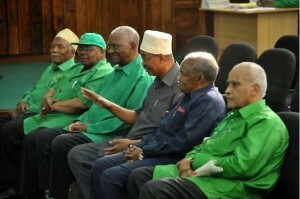 They included former prime ministers and ministers and many other prominent CCM officials. 3. Meanwhile, members of the CCM hierarchy were gathering in Dodoma to begin the lengthy and highly competitive selection process. 4. The person who appeared to have the best chance of winning for the CCM was former Prime Minister Edward Lowassa MP, who was popular in the party and had been campaigning hard. However, amidst strong protests from his many supporters, he was rejected as a candi­date by the CCM Party’s Ethics and Security Committee during the selection process. Protests from his supporters began immediately. 5. The CCM then chose as its new leader and presidential candidate Dr John Magufuli. He was described as “relatively unknown,” although he was, at the time, Minister of Works in the CCM government. 6. The CHADEMA party saw the chance of having a really well known candidate as its leader and, to astonishment all round, Lowassa sud­denly resigned from the CCM and accepted CHADEMA’s invitation to become its new leader and hence its presidential candidate. All this hap­pened very quickly. Lowassa had been a forceful critic of CHADEMA (and vice-versa) for many years and now he found himself as the party’s leader! This confirmed that Tanzanians, like many other voters around the world, often choose their governments on the basis of personality rather than policy. 7. In the previous elections, in 2010, CHADEMA’s presidential candi­date had been the party’s Secretary General, Dr. Willbrod Slaa. He got a surprisingly good result with 2.2 million votes (23.64%) while the winner, President Jakaya Kikwete, got 5.2 million votes (61.7%). Thinking that there was plenty of time Slaa arranged to visit Britain in July this year, presumably to mobilise the Tanzanian diaspora to his side but he had to cancel the visit and hurry back to Dar Salaam to look after his political interests there. Then arrived the news about Lowassa which must have shocked him. He disappeared from the public eye for a few days before emerging to say that he had resigned from CHADEMA and, apparently also from politics altogether! 8. Similarly, Lowassa’s move to CHADEMA has affected other par­ties in the opposition UKAWA coalition. Professor Ibrahim Lipumba, national chairman of CUF and the party’s previous presidential candi­date, has also decided that he was not comfortable sharing a platform with Lowassa. Like Dr Slaa, he has resigned both from his leadership position and apparently from active politics. CCM Secretary General, Abdulrahman Kinana, with Edward Lowassa at the party’s National Convention in Dodoma, prior to Lowassa switching to CHADEMA. The first step in the election/selection process in the CCM (the other parties have similar processes) was to reduce the field from the 38 can­didates who returned their nomination papers, down to only five. This is the function of the party’s Central Committee (CC). The first job was to eliminate persons with criminal records or corrupt behaviour and the CC was also expected to look into whether the candidate’s heart was aligned with that of the party. Other considerations were the education and professional conduct of the candidates. “The elders,” who reportedly played a highly influential role in the party’s choice. The five they chose were Minister for Foreign Affairs and International Cooperation, Bernard Membe; Deputy Minister for Science and Technology, January Makamba; Minister for Works, John Magufuli; Minister for Justice and Constitutional Affairs (and former UN Deputy Secretary General) Dr Asha Rose-Migiro; and the little-known African Union Ambassador to the UN, Amina Salum Ali. The National Executive Committee then cut the list down to three – leaving out Bernard Membe and January Makamba. In the final stage, Dr John Magufuli obtained 2104 (87%) of the votes and beat his two challengers Ambassador Amina Suluhu Ali who got 253 votes and Dr Asha Rose-Migiro who got 59. Dr Magufuli hails from the Geita gold-mining region south of Lake Victoria. He is a chemist with a Masters degree from Salford University UK and a PhD from Dar es Salaam University. He has gained a repu­tation as a competent technocrat with a good head for statistics. He worked as both a teacher and an industrial chemist before becoming an MP in 1995 when he was immediately appointed Deputy Minister of Works. He has held a variety of portfolios since that time and has quietly built a reputation for completing projects successfully and for not tolerating under-performing officials. After Magufuli’s victory, according to the account in Africa Confidential, delegates decked in the CCM colours of green and yellow erupted into thunderous applause at the Jamhuri Stadium in Dodoma when he made a light-hearted remark: “To all irresponsible leaders, thieves and corrupt officials please be informed that I will deal with you in a very polite way”. The choice of Magufuli came as a surprise to most people. However, according to the media, former President Benjamin Mkapa had quietly pushed for his candidacy having recruited him as Deputy Minister of Works when he became president in 1995. As Africa Confidential said in its July 24 issue, CCM is counting on the fact that Magufuli’s name is less associated with corruption or rumours of it than many of his original rivals for nomination, including Lowassa. After his election there were many comments. The National Chairman of the small United Democratic Party (UDP) Mr John Cheyo, described him as a hardworking person with a good track record. His work in several ministries had made him widely acceptable while his no-non­sense stance would restore hope among many. However, Singida East MP Tundu Lissu (CHADEMA) had nothing positive to say about him. “Whoever comes out of muddy water is also dirty,” he asserted. Magufuli himself said “I am profoundly overwhelmed by the results but I promise to give the CCM a resounding victory in October. I also promise to serve all Tanzanians to the best of my ability in line with the law of the land and the spirit of good governance”. As his running mate Dr Magufuli named Ms Samia Suluhu Hassan for the Vice Presidential position. She comes from Zanzibar, in line with the country’s constitution that stipulates that if the President comes from the mainland the Vice President must be from Zanzibar. Ms Hassan is the MP for Manyovu and has worked her way up from the ranks of a government typing pool, after taking a Masters degree in the United States, to her present elevated position. She had been picked, said Magufuli, because she was a Zanzibari who understood the challenges facing the Union, having worked closely with the team addressing Union issues for almost a decade. Explaining further his choice of Ms Hassan, Dr Magufuli said that it was because of the trust he has in women’s abilities and commitment. He revealed that his political mentor, when he was appointed Deputy Minister for Works ten years earlier, was a woman – Ms Anna Abdullah – who had helped him greatly. Mr Lowassa took his BA degree at the University of Dar es Salaam in 1977. In 1978 he was drafted into the army and fought in the Kagera War between Tanzania and Uganda. He later took an MSc in Development Studies from the University of Bath. His first major job was as a Minister of State in the Vice President’s office. His career thereafter can be summed up as “up, down and up again”. He continued as a hardworking minister but in 2005 he decided not to seek the CCM presidential nomination but became instead a key campaigner for his long term friend Jakaya Kikwete in his bid for the presidency. 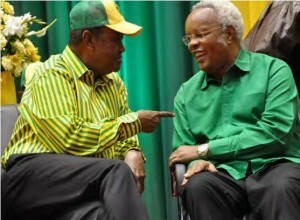 He helped Kikwete to win and in return President Kikwete made him Prime Minister. He was up again. Then, in 2008, he was down because he was alleged to have been involved in the Richmond energy scandal and decided to resign from the prime ministership even though he vigorously rejected the sugges­tion that he might have benefitted personally. Lowassa insisted that he was not guilty of corruption and was merely doing what he had to do as Prime Minister and arrange for an appropriate series of enquiries into the scandal. In the 2010 elections he won his seat in parliament for Monduli with a huge majority and was up again. As the 2015 election approached, he had become the favourite to win the CCM nomination. After his selection as CHADEMA candidate and leader of the main opposition party, he claimed to have been rapidly endorsed by 1.6 million CHADEMA members from 32 regions. The party’s Deputy Secretary General (Zanzibar) Salum Mwalimu said the signatories were just the “initial capital” that would assure Mr Lowassa of massive sup­port during the October 25 poll. In a move towards consolidation of the opposition parties and arising from the unresolved differences between the government and the oppo­sition on the proposed new constitution (the referendum scheduled for mid-2015 has been postponed indefinitely) a new party grouping has emerged. UKAWA is the acronym for Umoja wa Katiba ya Wananchi or the “Movement for People’s Constitution.” It is not a legal entity but has proved remarkably successful in holding together the different parties which have wisely come together to oppose the CCM. The group com­prises CHADEMA and CUF plus two smaller parties, NCCR Mageuzi and the National League for Democracy. These parties have agreed to field a single Presidential candidate – Edward Lowassa – and a single candidate for the parliamentary seat in each constituency, with the constituencies divided up in an agreement between the leaders of each party. While all this was going on the ambitious and fiery Zitto Kabwe MP, who is admired by many for the energy and determination he has put into his fight against corruption, tried to decide what to do. He had joined CHADEMA at 16 while studying for a degree in econom­ics in Dar and then in 2010 took a Masters degree in law and finance from a German university. He became MP for Kigoma North in 2005 and rose rapidly. He became Chairman of the influential Public Accounts Committee of the National Assembly and also brought together MPs from different parties to review the mining industry. They devised a new law which became the Mining Act 2010 which made major changes in policy. The East African described him as the “One man Backbench.” Although he was appointed as No 2 in his party he chafed against the CHADEMA leader­ship and eventually resigned from the party. He then found a new home in a new party – the Alliance for Change and Transparency (ACT-Wazalendo) and became its leader, He started to develop the party so that it could take a major role in the October elections and talked about having over 200 candidates. He clearly intends to stand for the presidency himself in future, but is barred in 2015 as he is just below the minimum age of 40. Instead, ACT-Wazalendo has nominated their party chair, Anna Mghwira (56), as their presidential candidate. She becomes the only female presidential candidate on this year’s ballot paper. 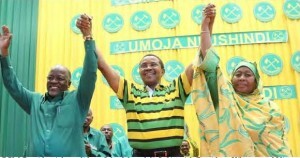 The subject of party or individual policies was hardly discussed at all during the fight for the CCM presidential candidacy. People asking questions were usually told to wait for the party manifestos which would explain all. One guide as to what might happen in the November elections is the result of the nationwide local elections which were held in December 2014. The results favoured the CCM as they have done in every election since independence. CCM won comfortably in seat after seat in rural areas but did less well in some urban areas where CHADEMA made advances. There were many irregularities, mainly connected with a failure to deliver election documents in time, late opening of voting centres, late delivery of ballot papers and some mixing up of names. The government admitted that these local elections had been flawed in at least 13 regions and put the blame on officials in district councils. The Ministry of Local Government, which was responsible for the administration of the elections, said that it was the responsibility of the regions to submit reports explaining what had happened in their areas. As a result of cases of mismanagement of the local elections, six district executive directors were sacked and 11 others were subjected to various disciplinary measures. The government plans to make the National Electoral Commission manage local elections in the future. Amongst the published local election results were the hotly contested Arusha Region where CHADEMA got 75 neighbourhoods and CCM 73. In Mtwara CCM won in 58 seats and the opposition won 53. In Shinyanga Municipality the opposition won 29 seats and CCM 26 but, in the rest of Shinyanga Region CCM won 65 seats and the opposition parties won 18. In Mwanza Region CCM won in 96 seats, CHADEMA got 70 and CUF took 7. As an indication of the way in which voters in coastal areas voted, the favoured opposition party was often CUF and not CHADEMA. In Tanga Region for example CCM won 118 seats, CUF 60 and CHADEMA only 2. In Dodoma Region, always a CCM stronghold, it won with over 90% of the seats. In Bukoba Region, in Muleba District, out of 164 villages CCM got 89 and CHADEMA 70. In Bukoba Municipality out of 66 seats, CCM won 35, CHADEMA 29 and CUF won 2. Before the elections CCM had been holding 55 seats. If the results from the local elections are followed by similar trends in the national elections in October, CCM seems likely to retain power. However, the voting population now includes larger numbers than before of young people, most of whom tend to support opposition par­ties. In Zanzibar things are different, as they have always been. This time there could be again a fierce battle between CCM and CUF and, if there are signs that CCM may not win, the CCM party could take drastic measures. The opposition CUF party, the leader of the party in Zanzibar, Seif Shariff Hamad, and its (former) national (Tanzanian) leader, Professor Lipumba, have tried several times before to win but each time have been beaten by CCM often with very small majorities. Virtually all the elections in Zanzibar since independence have been troublesome. Some of the more observant international observers have alleged breaches of the rules including both a rigging of the voter registration process and the involvement of non-Zanzibaris in voting in certain key seats. Zanzibar has a history of electoral violence and some people died during the 1995 and 2005 elections. The formation of a government of national unity with ministers from CCM and CUF working together for the last three years has brought some stability and less tension to the Isles. CCM has chosen the existing President, Dr Ali Mohammed Shein, as its candidate for the presidency of Zanzibar and CUF has again chosen its Secretary General Seif Sharif Hamad. The introduction of new Biometric technology ahead of the October 25 elections appears, despite many delays and numerous other problems during the process, to have been rolled out very successfully. The National Electoral Commission said that just over 24 million Tanzanians aged 18 and over had registered, which was a remarkable achievement. The figure was only about 300,000 short of the total number of eligible voters as estimated by the National Bureau of Statistics. The fight between the main candidates for the presidency of Tanzania seems likely to be a titanic struggle. On the one hand there is John Magufuli, backed by the massive CCM Party “steamroller” with its representatives in almost every street and lane in the country and which has won every national election in the United Republic since independence. On the opposition side there is Edward Lowassa, meaning that the opposition will be represented by a leader of greater national promi­nence than ever before, and considerable popularity. Lowassa officially represents CHADEMA, but the other parties in the UKAWA coalition are backing him and will not put forward presidential candidates. As such, the opposition vote is likely to be united as never before. If this group remains intact until the election it could do much better than many expect. 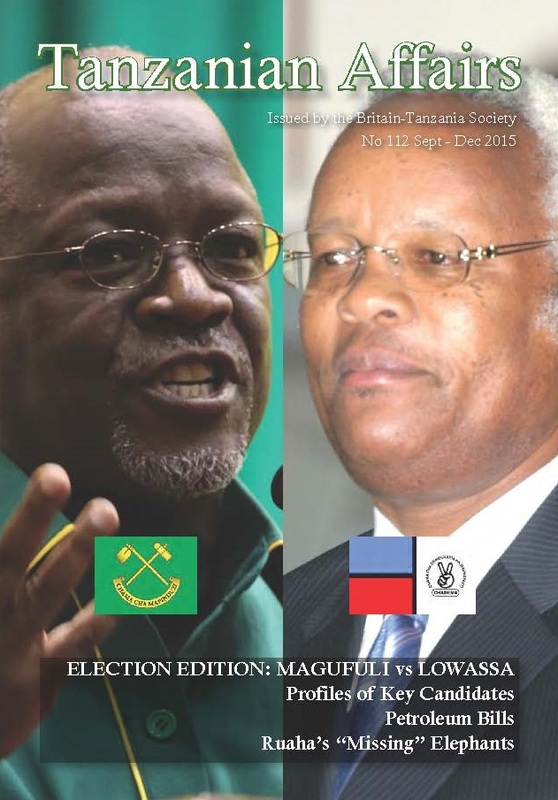 At the time this edition of TA went to press there was no clear indica­tion about how many MPs and other CCM leaders would follow Mr Lowassa in defecting to CHADEMA. It is likely that some regional level CCM officials will switch sides, and possibly some CCM members who lose out in the race for the party’s nomination as parliamentary candidates. But it also appears than none of Lowassa’s more prominent supporters in the 2010-2015 parliament and cabinet have followed him, though there is still time for this to change – just another complicating factor in trying to determine who will win. As this edition of TA went to press other sensational news arrived from Tanzania. In a major policy reversal, Lowassa and the UKAWA parties have announced that they will, if elected, radically change Tanzania’s pro­posed new constitution. President Kikwete and the CCM government have insisted that the present government of two parts (one government for the Union and another for Zanzibar) as laid down by Father of the Nation Julius Nyerere in the 1960’s, must be continued. The highly con­troversial alternative – one small government for Tanzania, a large one for the mainland and a small one for Zanzibar – as proposed by Judge Warioba when he presided over the preparation of the new constitution and now backed by Lowassa, could have a major effect on the election results. Many, especially in Zanzibar, strongly favour giving greater independence to the islands. Others contend that the change could prove very expensive and lead to the end of the Union between the mainland and Zanzibar. Mr Lowassa is being greeted by huge crowds as he tours the nation. Mr Freeman Mbowe, Chairman of CHADEMA was rushed to hospital in mid-August suffering from fatigue and exhaustion. He responded well to treatment and was released two days later. At a meeting of the Mwalimu Nyerere Foundation in Dar, fears were expressed that the police were working in favour of CCM and against the opposition. It was reported that they had used tear gas to clear the Arusha-Moshi Road when a crowd had blocked it demanding that Lowassa should be able address them. Police in Mwanza were also reported as having used tear gas to disperse CHADEMA members after Lowassa had arrived in the region to collect guarantors’ signatures. A second former Prime Minister, Frederick Sumaye, has announced that he too is leaving CCM to join CHADEMA and UKAWA. Sumaye, who previously served as Prime Minister throughout the ten-year administration of President Mkapa from 1995 to 2005, was among the 38 contenders for the CCM presidential nomination. “My decision to join Ukawa has nothing to do with the originality of Ukawa’s presidential candidate, Mr Lowassa or most of its top leaders. I want to use my administrative experience to speed up people’s devel­opment soon after the October elections,” he said. 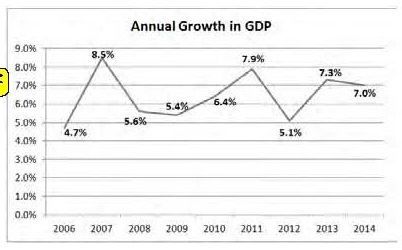 The Tanzanian economy con­tinues to grow, at a rate of 7% in 2014. (Hali ya Uchumi 2014). Construction, transport and financial services were the fastest growing sectors. 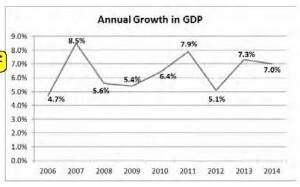 Estimated GDP per capita was TSh 1.72 million (USD 1,038), a small real increase over the year. This allowed the Minister of Finance, Saada Mkuyu, to state in parliament that Tanzania is on the verge of achieving middle-income status. Over 1 million people were added to the payroll in the private sector in the ten years 2005 to 2014, increasing the number of people formally employed from just over 1 million in 2005 to over 2 million in 2014. The National Bureau of Statistics reported results from the Employment and Earnings Survey of 2014. The biggest growth in formal sector employment was from 2012 onwards and in the private sector. Dar es Salaam, Morogoro and Arusha feature in the NBS’ report as regions with especially strong growth. One-third of all formal sector employees are reported to be in Dar es Salaam. There was a big jump in the number of newly recruited workers in 2014 and in their average earnings, with changes in new recruitment particu­larly strong for professional and technical employees. The percentage of formal sector employees who are female – 37% – has not changed in this ten-year period. Unemployment rates have, accordingly, fallen, mostly among urban male adults. Changes were negligible for younger people, among women and people in rural areas. Prices increased by 6.1% in June – the same rate as a year earlier, but higher than the 4.5% and 5.3% in the two previous months. As is usual, increases in the prices of foodstuffs were the main cause of the increase in prices overall. The fall in the value of the Tanzanian shilling, depreciating by almost 20% in the first five months of the year, was reported with great concern in the newspapers. Much of the change was attributed by the Ministry of Finance to the strength of the dollar. Recent inflows of external funds resulting from increased export earn­ings from tourism, coffee and cashews as well funding from interna­tional development banks have stemmed the shilling’s decline. Currencies in Kenya and Uganda have been similarly affected and central banks in all three countries are reported to be taking actions to tighten liquidity and dealing in foreign exchange. At the time of writing, the exchange rate has recovered to around TSh 2,100 to the dollar, an improvement from the TSh 2,300 reached in June. The Annual Development Plan is tabled at the time of the budget. This year, the Parliamentary Standing Committee on the Budget identified the following priorities: managing inflation and depreciation of the shil­ling; scaling up efforts to reduce income poverty; construction of a new central railway line of standard gauge; increase electricity supply par­ticularly in rural areas; improve rural water supply services; improve irrigation; improve livestock and fishing sectors; accord priority to education and health services; and improve the business environment for private sector investment. The Annual Development Plan 2015/16 specified the following main policy targets: maintaining peace, stability, unity and strengthening good governance; poverty reduction; sustaining macroeconomic stabil­ity; value addition; increasing capacity for storage of food grains and strengthening crop market; attracting more tourists and promoting domestic tourism; and improving private sector participation in imple­mentation of development projects. Key issues of focus in the plan were identified: completion of ongoing development projects particularly projects in the “Big Results Now” initiative; ensuring food security; improving the business environment; developing human resource skills especially in oil and gas, science, technology and innovation; and mitigating effects of climate change. The budget, announced in June, includes plans to increase revenue from domestic sources and reduce the share of the budget coming from exter­nal financing from 14.8% in 2014/15 to 8.4% in 2015/16. Uncertainties about external development funding have led to a reduc­tion in the share of the budget for development expenditure. No new development projects are to be included in the budget, though there is a possibility that the new government after the October elections may choose, through a supplementary budget, to modify priorities and allocations. Tax revenues currently amount to 12.5% of GDP, not enough to fund much needed investments in infrastructure and social services. The World Bank argues that greater increases in domestic tax revenues are needed through a reformed, more productive and well-managed tax system. Among the measures included in the budget is a new levy on imported goods of 1.5% which is to be earmarked for improve­ments in the rail infrastructure. It is a measure which has been agreed by all the countries of the East African Community. There is also an increase in petroleum levy on petrol, diesel from 50 to 100 shillings per litre and on kerosene from 50 to 150 shillings, the proceeds from which will go towards rural electrification. The minimum wage has been increased and the low band PAYE rate lowered from 12% to 11%. At the time of the budget, the World Bank approved a fund of USD 100 million to help increase transparency and accountability in Tanzania’s governance, and to help improve public financial management. The Fund, however, also expressed concern about the accumulation of arrears in government payments and actions were urged to have them cleared. It commended a policy paper, approved by the cabinet, for a fis­cal framework for managing resources from natural gas which is based on international experience. There will be a Natural Gas Revenue Fund that will be fully integrated into the budget, with no parallel spending authority. President Kikwete, at the Dar es Salaam International Trade Fair directed all regional and district commissioners to stop banning the transportation and exportation of produce. He said that such bans do not benefit farmers and business but rather engender corruption. On a visit to the port of Dar es Salaam, World Bank Vice President for Africa, Dr Makhtar Diop commended its improved infrastructure and efficiency. He pointed out the benefits to the economy of Tanzania and its landlocked neighbours of a well-functioning port. An aspect of the planned large trading centre at Kurasini has been criti­cised by a representative of small traders now operating in Kariokoo who believe the new trading centre will benefit Chinese rather than local traders. Further progress has been made in the reduction of non-tariff barriers to trade in the larger region with an agreement between the governments of Tanzania and Zambia. Border management will be improved with a one-stop border post by the Nakonde-Tunduma corridor which will speed up transit times and lower costs of trading. Manufacturing is a growing albeit still a small part of the Tanzanian economy. A research paper for World Institute for Development Economics Research (WIDER) by Samuel Wangwe, Donald Mmari, Jehovanes Aikaeli, Neema Rutatina, Thadeus Mboghoina and Abel Kinyondo examined the manufacturing sector in Tanzania. It remains largely undiversified, and vulnerable to variations in agricultural pro­duction and commodity prices. The growth in output and exports, production innovation and product diversity have been most dynamic in the manufacturing of food prod­ucts, plastic and rubber, chemicals, basic metal work, and non-metallic mineral products. However, the extent to which Tanzanian manufactur­ers have added value has been limited by their dependence on imported intermediate goods. This limits inter-industry linkages that are impor­tant for promoting a domestic manufacturing base and employment. The authors conclude that various technological, financial, policy and administrative constraints remain unresolved and they are limiting faster industrial growth and transformation. In the last issue I wrote about the delay in the government arranging for a national referendum on whether Tanzanian voters should adopt a new constitution which was presented to it when the Constitutional Assembly completed their task of finalising a draft constitution in October last year. The referendum was scheduled to take place in April this year but was postponed indefinitely. One reason given for the April postponement was that the National Election Committee (NEC) were not satisfied that there was enough preparation and education given to the public about the proposed con­stitution, and also the fact that new Biometric Voter Registration (BVR) equipment had not been implemented. From the 22nd July voters were being registered through the new BVR system. This should mean one less obstacle to overcome. However, with the general elections now close at hand, it does seem as though the referendum has been pushed further down the govern­ment’s list of priorities. There has been talk of the referendum taking place at the same time as the general elections but there has been no confirmation that this will be the case. Prime Minister Mizengo Pinda and other Members of the Constituent Assembly recently implied that they might be able to sway President Kikwete into ensuring that the referendum take place before the elec­tions. There are many who are of the view that an agreement took place last September in which the parties agreed that the referendum would take place after the general elections. It is not possible to say with any certainty when such referendum will take place, if indeed it does. There is no clarity on this issue and it does seem as if politicians are in no hurry to push this agenda through only months before the election. The danger is that whoever is voted as our next president, will be reluctant to force such a controversial process at such an early stage of a new presidency. As the silence continues and the closer we get to the general election, the chances of a new constitu­tion grow slimmer and slimmer. We can but hope that over 3 years and a considerable amount of money spent on finalising a new constitution does not go to waste. The government has acted to address the two big hurdles delaying development of the liquefied natural gas (LNG) plant – namely, com­plex land acquisition procedures and the unclear legal framework (see TA 111). On the first, government announced in May that it had set aside TSh 12 billion (about US$ 6 million) to buy land and compensate 450 people in Lindi where the LNG terminal is to be built. The plant, which will process the large volumes of gas discovered in recent years offshore southern Tanzania, may cost the developers US$ 30 billion and is unlikely to start operating until the early 2020s. The development consortium comprises the licensees that discovered the gas (BG Group, Statoil, Exxon Mobil and Ophir Energy). Reuters reported the consortium will make a final investment decision next year. So far, more than 53 trillion cubic feet of gas has been discovered and analysts believe that Tanzania (along with Mozambique) is now in a race with Russia, Australia, the USA and Canada to satisfy the gap in global gas supply expected by around 2020. Reuters also reported that Royal Dutch Shell agreed in April to buy the BG Group for US$ 70 bil­lion in the first large oil industry merger in more than a decade, thereby giving the Anglo-Dutch oil giant access to BG’s Tanzanian projects. Amid much controversy the government has also addressed the second big hurdle, ensuring in early July in the last session of Parliament the passage of three petroleum sector Bills: Petroleum Act 2015, Oil and Gas Revenue Management Act 2015, and Tanzania Extractive Industries (Transparency and Accountability) Act 2015. These Acts were tabled, debated and passed under fast-track process known as a certificate of urgency, and in the absence of most Opposition MPs who, along with a group of about 60 Civil Society Organisations, pointed to alleged weaknesses in their content and flaws in the Parliamentary process and called for the Bills to be shelved pending further stakeholder discussions. According to The Citizen (6 July), there was continuous uproar in the National Assembly for three consecutive days as Opposition lawmak­ers repeatedly tried to block Energy and Minerals Minister George Simbachawene from tabling the Bills following the government’s insist­ence that MPs should debate them. The Speaker suspended the first session and then barred more than 40 Opposition MPs from attending – a ban the Opposition contended was a deliberate move to ensure the “controversial” Bills were passed without any meaningful debate. Minister Simbachawene said the Bills were sent to the House under a certificate of urgency because of their importance to the nation. The new laws were needed so government could negotiate good exploration and gas development contracts with investors. “We want this Parliament to debate the laws because they have been trained well enough on oil and gas issues … we even took them for learning tours to various countries such as Norway, China and Trinidad and Tobago”. He said deferring the Bills to the November Parliament would cause further costly delays to Tanzania and fresh training would be required for the new legisla­tors; moreover, preparations for the three Bills had started in 2010 and stakeholders were involved and their views considered at several stages. Among other things, the Petroleum Act 2015 establishes a Petroleum Upstream Regulatory Authority and an Oil and Gas Advisory Bureau (to advise the Cabinet on strategic matters). The Act also transforms the Tanzania Petroleum Development Corporation into the National Oil Company, with the mandate to manage the country’s commercial interest in petroleum operations as well as downstream natural gas activities. It seeks to ensure that the gas industry benefits all Tanzanians includ­ing through the sourcing of Tanzanian goods and services, the training and employment of Tanzanians, and technology transfer. It repeals the previous petroleum laws, including the Petroleum (Exploration and Production) Act 1980 under which all exploration and development contracts and operations have been conducted for more than three dec­ades but which did not fully address gas issues. Tanzania’s plans for generating electricity from renewable energy resources should complement the country’s existing commercial energy supplies of hydropower and gas. 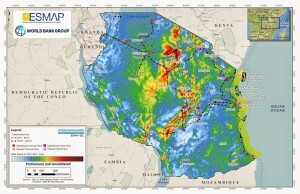 In May, TANESCO announced pre­liminary results from the World Bank’s renewable energy resource mapping project, using global datasets and satellite analysis, indicating that Tanzania has immense solar and wind potential. The country’s resources suitable for solar power generation are considered to be equivalent to those of Spain whilst Tanzania’s potential for high wind power covers more than 10% of the country (an area the size of Malawi). 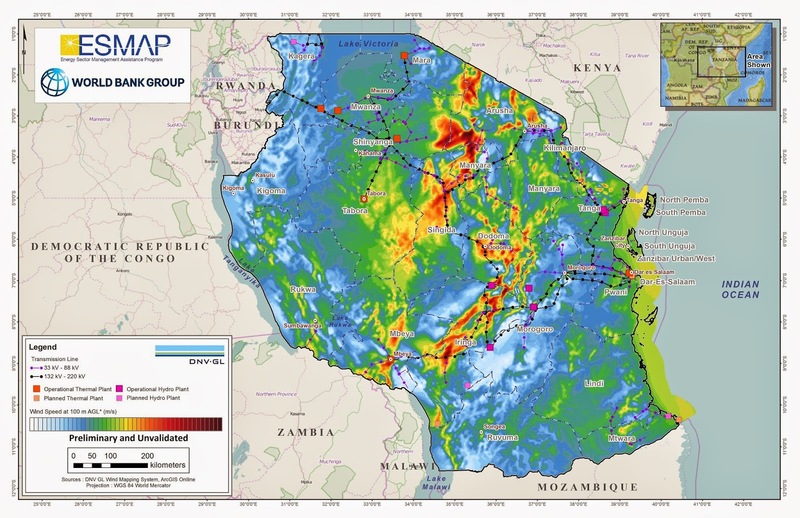 One key finding is that certain areas of Tanzania with high solar irra­diation also have high wind speeds at night, raising the possibility of round-the-clock power generation. These initial findings will be validated over the next two years by plac­ing 30 ground-based solar and wind measuring stations around the country, as part of a long-term partnership between the World Bank and TANESCO to modernize Tanzania’s power sector. A report (Seizing Africa’s Energy and Climate Opportunities 2015) by Kofi Annan’s Africa Progress Panel says 621 million people in Sub-Saharan Africa lack access to electricity. Energy bottlenecks and power shortages cost the region two to four per cent of GDP annually. Yet, driven by economic growth, demographic change and urbanisation, African energy demand is surging – widening further the energy gap between Africa and the rest of the world. Annan’s report says it would take the average Tanzanian eight years to use as much electricity as an average American consumes in a month! The Minister for Trade and Industry, Dr Kigoda, announced to Parliament in May the start of development of two related mega industrial-mineral projects – the Mchuchuma coal and Liganga iron ore projects in Iringa. They will establish an iron industry with an annual production capacity of one million tonnes (making Tanzania the third largest iron producer in Africa). Mchuchuma mine has more than 500 million tons of coal deposits, enough to produce 600 megawatts (MW) of electricity for more than a century. The coal-fired electricity plant will generate 250 MW for the iron industry and 350MW for the national grid. Minister Kigoda said the two projects will create 32,000 jobs and gener­ate about Tshs 3.13 trillion (US$1.5 billion) annually. They will be the largest single industrial investment in Tanzania since Independence. The projects are being implemented by Tanzania China International Mineral Resources Ltd, a joint venture between Tanzania’s NDC (20%) and a Chinese firm (80%). According to Press reports these mega pro­jects will cost up to US$3 billion to develop. Assistant Director of Crop Research at the Ministry of Agriculture, Food Security and Cooperatives Husain Mansoor has announced that scien­tists will, in future, be allowed able to carry out confined field trials of Genetically Modified crops without fear. Under the previous regulations a strict liability clause had meant that scientists, donors or partners funding research could be held accounta­ble in the event of any damage that might occur during or after research on GM crops. The new rules allow scientists to carry out confined field trials of GM crops to find out their effects on humans and the environment. Plant materials would have to be enclosed within a laboratories or green­houses and field trials would be undertaken only in specific areas, usu­ally small pieces of land set aside for experiments. For some time Tanzanian scientists have been keen to pursue their trials on drought-resistant and insect-tolerant maize under a new interna­tional project entitled “Water efficient maize for Africa and cassava vari­eties resistant to mosaic and brown streak diseases”. It is anticipated that this project will promote drought-tolerant and insect-protected maize using conventional breeding methods. Its goal is to make these varieties available royalty free to smallholder farmers through seed companies associated with the Nairobi-based ‘African Agricultural Technology Foundation’, the coordinating agency. Scientists plan to carry out the first confined field trials of GM modified maize tolerant to drought and pests this year and hope to commercialise it when research is completed in coming years. Cotton has been, for many years, a mainstay of Tanzania’s economy. During the last three years, however, production has declined substan­tially. In 2011/12 350,000 tonnes were produced, but this dropped to 246,000 tonnes in 2012/13 and just 201,000 tonnes the following year. In these circumstances, Director General of the Tanzania Cotton Board, Gabriel Mwalo, accompanied by many experts and others involved in the industry, held a significant press conference in Dar es Salaam recently. He expressed concern about the state of production and admitted that the Cotton Board had not played its part well, but pointed out that the industry was handicapped by a lack of a reliable input supply system and that there had been frequent changes in world market prices. He said that these had greatly affected performance in terms of yield per hectare. The decision to liberalise the cotton industry in the early 1990s had been a success although it was still facing a number of challenges. The number of ginneries had increased from 36 in 1993 to 56 and the number of cotton buyers had also increased to about 35 companies which had largely taken over from a handful of large regional cooperative unions. Speaking about cotton seed he stated that in the last season almost 17,000 tonnes of fuzzy seeds and 1,200 tonnes of de-linted seeds had been distributed. He said that there was a high demand for clean seeds for oil milling purposes but this demand could jeopardise the availabil­ity of good seeds for planting. There were no cotton seed production farms in the country so that the industry had had to depend entirely on seed cotton produced by the small farmers themselves. He said that the problem of poor seed germination could best be dealt with through contract farming, where farmers’ business groups would be the centres of cotton sales and custodians of their own products. He added that in embracing contract farming, the system of using gin­ners would be abolished. Such a model of cotton production would not only assure farmers of better seeds for planting but would also ensure quality yields and high incomes since cheating through weighing scales would no longer be there. The lasting solution was to use certified seeds. During the first Franco-Tanzanian Economic Forum held in Paris in March 2015, organised by the French Business Confederation (the most representative organisation of the private sector in France), French investors showed considerable interest in investing in livestock and fisheries in Tanzania, according to Tanzania’s Minister for Fisheries and Livestock Development Dr Titus Kamani, who attended the forum. Last year Tanzania harvested a record 2.5 million tonnes of maize. The country then began talks with China so as to find a market for this huge surplus. America previously supplied China with maize but Beijing suspended the deal after the US started using genetically modified tech­nology in maize growing. China’s growing demand for maize is driven by population and economic growth. During the last three years Tanzania has been harvesting more food crops than it can consume having enjoyed 118 percent food sufficiency in 2013. The Tanzanian farming system is largely dominated by smallholders cultivating average farm sizes of between 0.9 and 3.0 hectares and mechanisation is limited. The government has now received a loan of €50 million from Poland to help it in assembling Polish tractors locally. It is understood that Tanzania will start assembling the tractors this year. The TIB Development Bank is providing TSh 729 million in loans to construct two major ultra-modern grape processing plants in the Dodoma Region. This will enable grape producers to start sell­ing millions of litres of grape juice to Kenyan and South African wine companies. At the initial stage of development of this new industry Chamwino District farmers received financial support from the CRDB Bank to grow more than 300 hectares of grapes. The project is reported to be going well. At a recent conference on climate change, a senior lecturer in Animal Science at Sokoine University of Agriculture, Dr Msalya, said that in a study conducted in 2014, although Tanzania had huge potential for milk production its actual production was only some 2.3 billion litres. This was far below UN Food and Agriculture global standards which are based on consumption of 200 litres per person annually. In order to reach this standard Tanzania needed to step up its production to 9 billion litres per year. Dr Msalya mentioned various problems including the case of a small project under which goats from Norway had been supplied to small­holders to help them produce goat milk. However, the project had had to be abandoned as those involved started to sell the goats rather than market the goat milk. In its unrelenting efforts to gain control of what it calls the Malvinas (and Britain calls the Falkland Islands), the Argentine Secretary for Malvinas Affairs, Mr Daniel Filmus, has approached African countries to help it regain the disputed territory. In April this year Argentina invited reporters and editors from across Africa to a conference in Addis Ababa to drum up support for its diplomatic efforts to regain the islands from the UK. The Secretary made a passionate appeal to Tanzania to support its cause as it had done in the past during the liberation of Southern African countries. He mentioned Tanzania’s notable support at the UN for oppressed people. “Tanzania’s role in our cause is very crucial because of its track record of always siding with the oppressed and standing against the oppressors,” Mr Filmus said. Responding to the Argentine positon that the UK had seized the islands and expelled indigenous residents, the UK High Commissioner to Tanzania, Ms Diana Melrose, said that the Argentinian claims were abso­lutely untrue. “There were no indigenous people on the islands before the first settlement established by France and the UK in the 1760s” she said. The UK had administered the Falklands peacefully and effectively for 182 years, interrupted only by the short-lived Argentine invasion of the islands in 1982”. Ms Melrose said that the Falkland Islands had never legitimately formed a part of the territory of Argentina and British sovereignty predated the existence of Argentina itself. Ambassador Filmus said that the UK came and seized the islands. “We shall regain them through diplomatic means with support from the international community”, he said. Violence escalated seriously in Yemen during recent months and there have also been attacks by South African citizens on foreigners working in South Africa. In both cases arrangements were made by the govern­ment to evacuate Tanzanian personnel trapped and wishing to leave. Two Tanzanian peacekeeping soldiers in the Democratic Republic of the Congo were killed in May when their convoy was attacked by sus­pected rebels in Kivu. This is the question that all who value the elephants of Tanzania will find themselves asking in the coming years if no concerted effort is made to tackle successfully the systematic slaughter currently affecting this most charismatic of species. On 1st June, the Ministry of Natural Resources and Tourism in Tanzania officially released the results of a nationwide survey of the elephant population, which estimates that there are between 40,400 and 46,600 elephants remaining. This represents a decline of 60% since the last census in 2009. This authoritative study, funded by Paul G. Allen, the co-founder of Microsoft, and conducted in conjunction with the Frankfurt Zoological Society, included all of the seven key ecosystems where elephant have traditionally be found in large numbers. The decline in elephant numbers in the Selous has been well docu­mented before now, with the historic low point being recorded in 2013 at 13,084. Happily, in 2014, the number was up slightly to 15,217, but, as Rob Muir, the Africa Programme Director for the Frankfurt Zoological Society is quoted as saying in an article in The Daily Telegraph on 19 July, this is probably due to the fact that their numbers have reached ‘a critical threshold’ and are so low that the poachers are unable to find them as easily as had been the case. Alarmingly, this raises the spectre of the poachers turning their atten­tion to other locations with high populations – and the statistics bear this out. The 2014 census showed the other areas most hard hit to be the Malagarasi-Muyovozi and Ruaha-Rungwa ecosystems, where the populations were down 81% and 76% respectively. Such statistics should prompt politicians into concerted action if they are to safeguard both Tanzania’s natural resources and the long term future of a tourism industry that depends upon the elephant and other threatened creatures like the rhino and lion. Instead, they often panic and say things that make the rest of the world sit up in surprise. In this case, The Tanzania Daily News on the 4th of June reported how Natural Resources Minister Lazaro Nyalandu, said that TANAPA would launch an investigation into the 12,000 elephants “missing” from Ruaha. However, it is unlikely that these elephants are merely “missing”. High carcass rates were recorded in all areas surveyed, which is an accepted method of determining abnormally high mortality rates. Additionally, not all carcases will be spotted: many are picked clean of flesh and hid­den by vegetation long before. Certainly, many elephants have moved deep into the bush to avoid detection, or, as reported by a camp manager in Ruaha National Park who prefers to remain anonymous, clustering together in large numbers for perceived protection. Normally, in July, when water is still easily available, elephant will be dispersed and feeding peacefully in small family groups. While the stability of population numbers in the Serengeti and Tarangire ecosystems provides a glimmer of hope, the Tanzanian Government should not under estimate the damage to the Tanzanian tourism indus­try that a widespread perception of unfettered poaching in the country will do. The African tourism industry is immensely competitive and the tourists will go to where they think the animals to be. Both The Guardian and The Telegraph picked up the story of the catastrophic decline in elephant numbers, following on from The Daily Mail and the BBC last year. If the international media is consistent in its reporting on the conserva­tion failings in Tanzania, then it will take a lot more than some advertis­ing in Sunderland on a match day (Tanzaniainvest.com) to repair the damage. 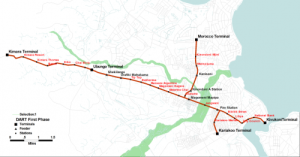 The annual event that is flooding in Dar es Salaam has once again caused several days of transport chaos in the city. Two days of solid rain rendered many roads impassable, paralysed transport networks and caused extensive delays. Police had to step in to manage the crisis. Hundreds of residents of the city fled their flooded homes and sought shelter elsewhere. The hardest hit areas included Tegeta, Kawe, Sinza, Msasani, Masaki, Oysterbay, Kinondoni, Tandale, Mbezi and Kimara. In Jangwani, Kariakoo, Kigogo, Buguruni, Ilala Sharif Shamba and Tabata Dar es Salaam residents paid the price of clogged drainage sys­tems and roads. Many homes were submerged, causing considerable suffering. The flood waters reportedly also claimed at least three lives. The Prime Minister, Mizengo Pinda, reported to parliament that the flooding had caused Tsh 9.5bn worth of damage, mostly to road networks. Trials of the long-awaited Dar es Salaam Bus Rapid Transit (BRT) com­muter bus system are underway, along with training for drivers. The system, also known as DART, is expected to be formally launched and to become fully operational in October. The project was launched in Sept 2010 by President Kikwete (see TA 98). Along these routes, a fleet of 76 buses, each carrying up to 150 passen­gers will replace current daladala services along these routes. Daladalas will continue to operate elsewhere in the city, including feeder routes connecting passengers to the BRT system. Once the system is fully operational, the new buses are expected to carry 350,000 passengers per day. The trials are taking place without conductors, with passengers instead paying their fares through swipe cards, similar the Oyster card system that operates in London. Bus fares have not yet been announced by the Surface and Marine Transport Regulatory Authority, SUMATRA.